When I grew up we played scissors paper stone. And I still much prefer saying “scissors paper stone” to “rock paper scissors” (which, to be honest, always sounds a bit ugly to me). But as this chart from Google shows, rock paper scissors has soundly thrashed scissors paper stone. So it’s time to change. But we’re not going to rush into it. We’re a (very) small team with a huge to-do list. So for new games, and as we update old games, we’ll make the change. So why do we use rock paper scissors for our resolution system? First, almost everyone in the entire world knows how to play. Second, you don’t need any special equipment to play. But I’m not very good at RPS? This article from the BBC highlights some strategies that players adopt that prevent the game from being completely random. Players who win, tend to stick with their winning rock, paper or scissors. In fact, if you’d like to test your skill, try this RPS simulator. 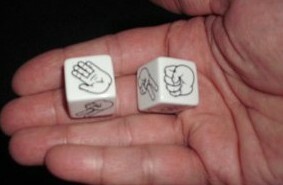 And if you’re still uncomfortable playing rock paper scissors, I picked up these dice on Amazon. This entry was posted in Design, Rules on June 9, 2014 by Steve Hatherley.